Lake Mission Viejo Yacht Club is located at a private lake and is a part of the Lake Mission Viejo Association. Membership is open to all members of the Lake Association. In the true sense of Corinthian Sailing, our goal at LMVYC is to promote sailing, to encourage good fellowship among yachtsmen afloat and ashore, and to introduce non-boat-owning amateur sailors young and old to the sport of sailing. Informal sailing lessons are provided free of charge to new members. Our fleet championship series of Regattas are held monthly from March through November. In addition, we are one of many host venues to the SCYA Midwinter Regatta held in February each year. Other sailing opportunities exist throughout the year including informal “pick up” races on Wednesday evenings during the months of Daylight Savings Time. During the months of July and August, we have summer “raft ups” followed by BYO-BBQs. - Regattas are held at least once each month (Except December) beginning with a tune-up regatta (practice races) in January. - In February we are one of the many hosts to the SCYA Midwinter Regatta. - March marks the beginning of the championship series which consists of 7 regattas (in as many months) that will ultimately determine each class' champion for the year. Ages 14 to 18 are encouraged to join the Lake Mission Viejo High School Sailing Team and train in Laser, CFJ and Balboa 13 dinghies. There are intra-squad scrimmages, and practice races against other high school sailing teams. Practice sessions are generally held on Saturday afternoons. LMVYC has long been known for its before- or after-Regatta meals. Members share in the task of organizing and preparing virtual feasts for sailorsand non-sailor members. Events include a chili cookoff, a Luau-themed dinner (pictured) and a German-themed Oktoberfest. 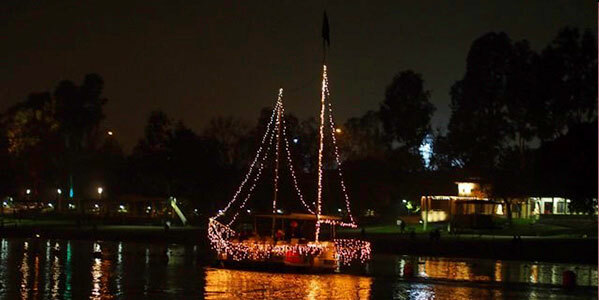 Each year, Lake Mission Viejo sponsors a Holiday Parade of Lights. LMVYC holds the honor of leading the parade in a "Schooner" built on the foundation of a pontoon boat. Assembly of the schooner is a team effort on the morning of the parade and disassembled the next morning.